Jonathan and I went to a Spanish tapas bar for our date night last week and it was delicious! I love grazing on my dinner like cattle…truly I do, and tapas give me an excuse to try a bit of everything. I’ve been scheming ways to make some at home every day since. While our schedules don’t currently allow for hosting a tapas party, I knew I needed to make something at home to satisfy my urges. Enter stage right: beef empanadas. I tend to shy away from making pastries or frying food at home because it can be a lot of work. However, I happened to have a few pie crusts hanging out in my freezer that needed love and attention. You can easily use Pillsbury crescent rolls if you want to cut out a few steps and save time. As for the frying? Well, you can bake these puppies instead, but why would you do that to yourself? These beef empanadas are packed with flavor and have a perfect flaky and buttery crust. I love that they are only three bites, which makes me feel a little better about eating fried foods. So if I’m doing my math right, eating 6 of them is practically a health food. Math is hard! 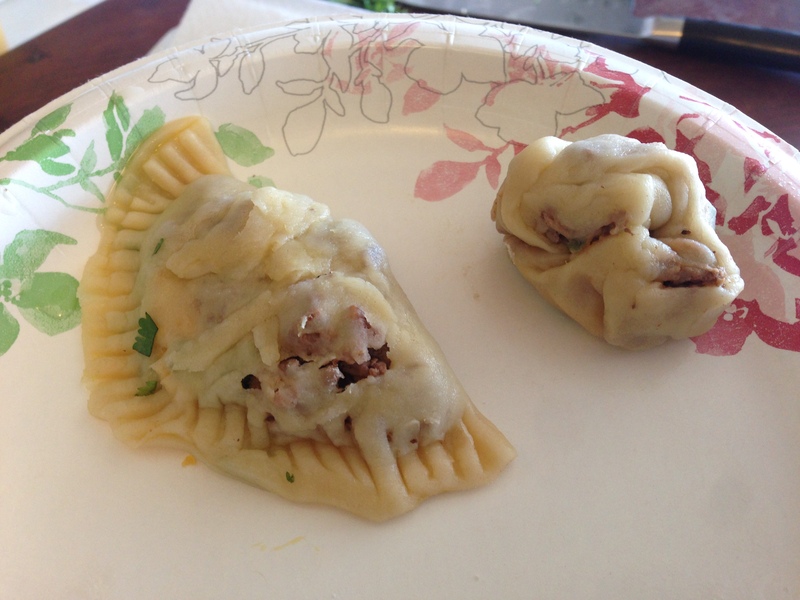 Makes approximately 20 empanadas with beef filling to spare! In a skillet over medium heat, sauté onions, jalapeño, and garlic in bacon grease (or olive oil) for 2 minutes or until slightly soft. Add beef and cook until brown, breaking it up into tiny bits. Drain fat from pan and set back on heat. Mix in the tomato paste, cumin, chili powder, salt, and pepper. 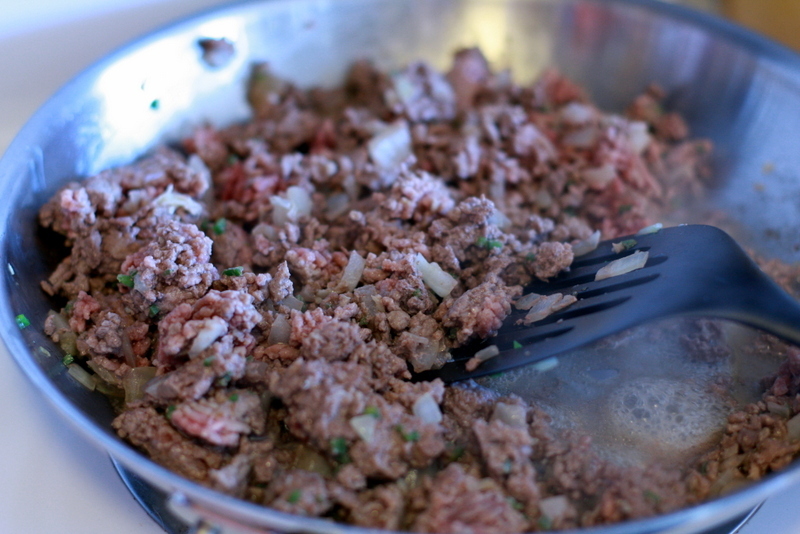 Taste the beef mixture and add more seasonings as you see fit. In a heavy-bottomed pot or a dutch oven, heat fry oil until 375 degrees. Give it at least 10 minutes over medium heat to come to temperature. Adjust until you get to 375 degrees. Roll out the dough on a floured surface until it’s approximately 1/8 of an inch thick. Use a large cookie cutter or whatever tool you have on hand (I used an empty 28 oz. 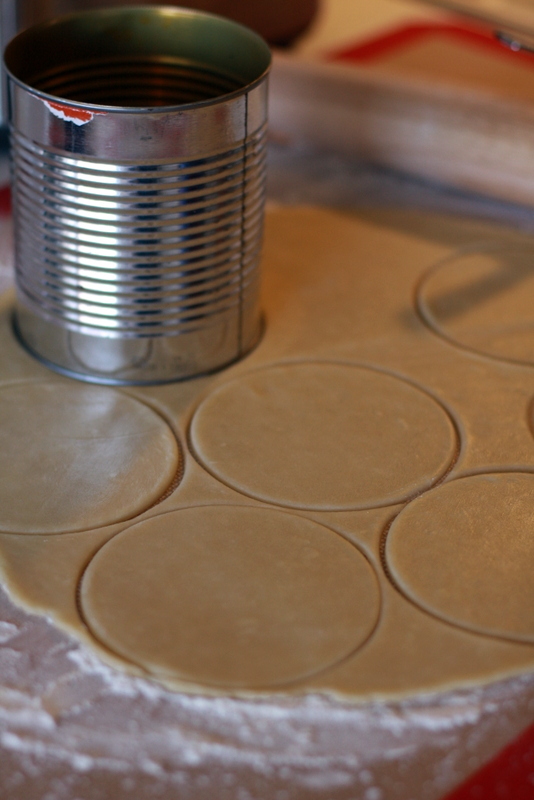 can of pumpkin as an empanada cutter) to cut circles out of the dough. 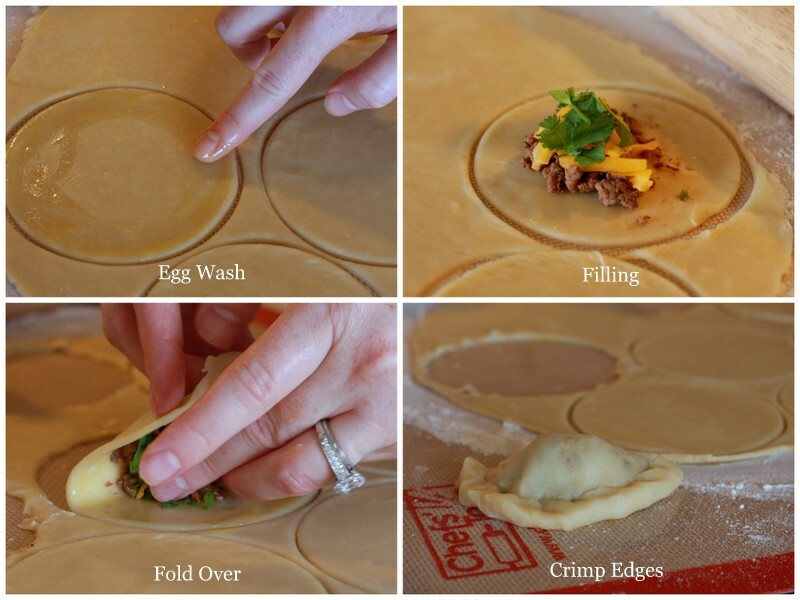 Dip your finger in the beaten egg and spread it around the outer edge of each empanada. This is the “glue” for the dough and prevents the empanadas from bursting open in the fry oil. Place approximately 2 tsp. meat mixture, 1 tsp. cheese, and a pinch of cilantro into the center of each empanada. 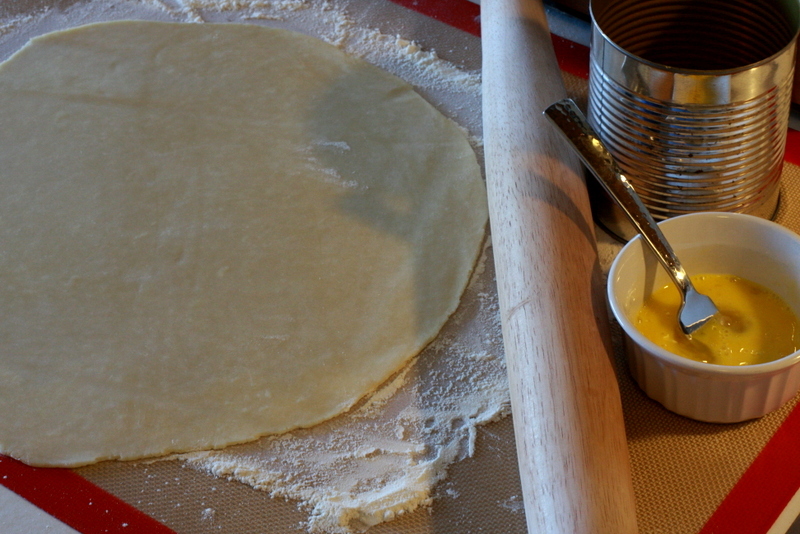 Gently fold the dough over the filling and crimp the edges together. You can use a fork or your fancy fingers to crimp it closed. Fry empanadas three at a time, flipping after about 2 minutes…just keep your eyes on it…when it’s golden brown, it’s ready to flip. 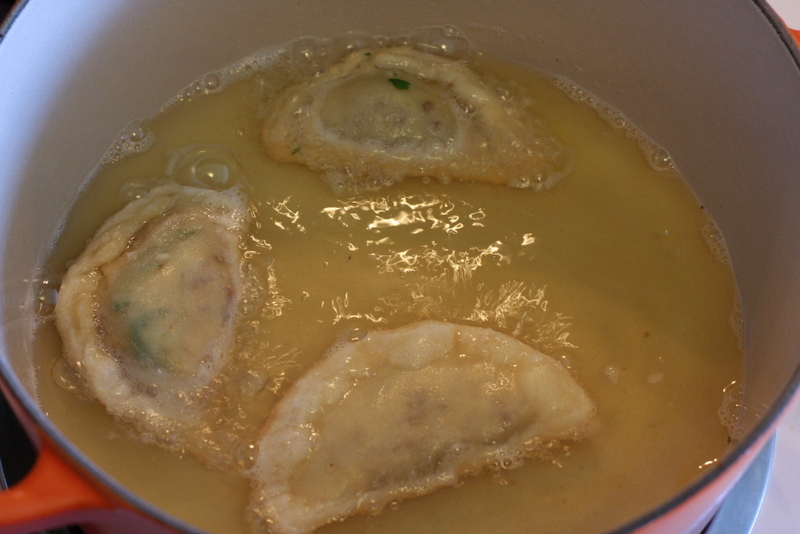 Use a slotted spoon to move the empanadas to a plate with a paper towel to allow it to drain off excess grease and cool. Notes on this recipe: I’ve been saving bacon grease in a mason jar in my fridge lately. It feels a little Howard Hughes-esque, but my life has significantly improved now that I have bacon grease on hand for sautéing vegetables and other things. If you happen to keep a jar of the stuff (you are a champion), then feel free to use it to sauté the onions, but you could easily substitute olive oil. You should buy tortillas to go with this recipe because you will have extra filling, but lucky for you, the filling tastes great as tacos too! #FAIL They still tasted damn good. Do not be like me. Be delicate and graceful and an empanada savant. Do not attempt to glue the rips in the dough together with more dough. Your food will look like a burn victim and it will appetize no one. There’s a solid chance I rolled out the dough too thin. Don’t do that. If you are like me (bless you! ), don’t worry. Hot fry oil cures all ails. Pop those bad boys in their little jacuzzi until golden brown! Can you hear them sizzling? I already miss them. Their poor little lives were cut too short. Until we meet again, my fried friends. This entry was posted in Appetizer, Meats, Recipes/Food by Mads. Bookmark the permalink.